Building a new roof or replacing an existing one is a major and important undertaking. With several kinds of materials to choose from, picking the best option can be overwhelming. While the idea of a metal roof might not immediately come to mind, its popularity is on the rise because of its durability, longevity, and versatility. Roofs need to be able to stand up against the elements and metal is a great resilient material to do just that. Metal roofs have been proven to survive everything from heavy rain and snowfall to fire to pests. Some can even sustain wind gusts of up to 140 miles per hour! Metal roofs are also resistant to erosion and cracking, and depending on the type of metal you select it can even be impact-resistant. 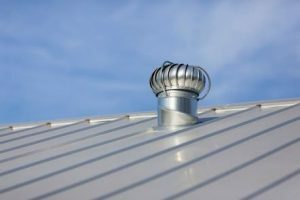 Because of these durable characteristics, metal roofs also don’t require as much periodic maintenance that other roofing materials do. Metal roofs are the perfect choice for the long haul. While your average wood or asphalt shingle roofs will last anywhere from 15-30 years, metal roofs can last for 60-70 years! Since metal roofs are less likely to rot, crack, experience mold growth and other harmful issues that most roofs are, metal roofs end up having a much longer lifespan. That longer lifespan will save you from costly repair and replace costs. Metal roofs can even help you save on energy costs during the warmer months, as metal will reflect heat from the sun. Metal roofs have come a long way from their industrial beginnings. Today, you can customize the color and design of your metal roof to achieve just the look you’re hoping for. Metal roofs can even mimic traditional styles like shingles and slate. If you have any roofing questions, contact Bruce’s Central today.